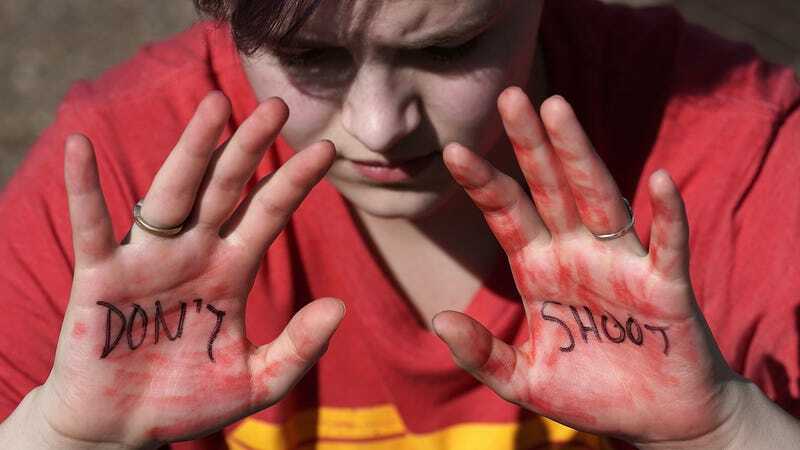 A student participates in a protest against gun violence Feb. 21, 2018, outside the White House in Washington, D.C.
As I am writing this, thousands of school-age children are walking out of classrooms all across the country to protest U.S. politicians’ unwillingness to enact commonsense gun control. The nationwide demonstration is being hailed as a groundbreaking act of civil disobedience that seeks to protect the lives of America’s most vulnerable citizens. There is no way anyone could object to something so necessary and relevant. Unless, of course, black people do it. The National School Walkout is a 17-minute planned act of defiance, protest and solidarity meant to spark action and commemorate the lives of 17 students gunned down at Marjory Stoneman Douglas High School in Parkland, Fla.
Let there be no misunderstanding: Nikolas Cruz is a mass murderer, and the massacre in Parkland was a tragedy. Hopefully this walkout will prompt our elected officials to take a long look at the nation’s gun laws because those students deserve better. Their lives are valuable. The game-changing, totally unique idea of the National School Walkout that is gathering attention all around the world is a tactic that has been tried before, to much derision. The people who sought to inspire meaningful change and spark conversation were called disruptive and communists and even castigated as terrorists. Then white people started doing it. In Madison, Wis., cops arrested and maced students who walked out of school in protest of the 2015 police killing of Tony Robinson. Of course, there are some who will say that this has nothing to do with race. The shooting in Parkland is a national story, and that is why people are paying attention to those kids. It’s not because they are white. The stories I just pointed out are lesser-known incidents, proving that people don’t care about the color of the students advocating for change, or even the skin tone of the victims. This is about all lives! But I might be wrong. This may simply be a case of imbalanced media focus. Who’s to say that the Parkland students are receiving more media attention for the walkout because the victims and the activists are mostly white? There is no one in America who doesn’t know about the tragic deaths of those high school students. It is a big, talked-about national news incident. Maybe they are garnering attention and inspiring legislative change simply because they are young and conscious. Of course, that wouldn’t explain why—unlike with the recently passed gun legislation in Florida—no one bothered to examine the “Stand your ground” law after high schoolers all over Florida walked out in protest of Trayvon Martin’s death, which was arguably more widely known. What about the students who walked out in protest of the Mike Brown nonverdict in St. Louis County? That was definitely a bigger story than Parkland. But anyone in a black community knows that stop-the-violence rallies greatly outnumber Black Lives Matter protests. However, the media refuses to cover those marches with the same rabid fervor. Why the hell would white people even hear about the Chicago elementary school kids who marched against gun violence in their communities in 2017? Or the black and Hispanic high school students in Los Angeles who walked out to protest gang and gun violence? Do they even know about the kids in Sandy Spring, Ga., who held a sit-in at school to protest gun violence? How about the kids at Chicago’s Polaris Academy who organized a “play outside” day in protest of gang and gun violence almost a year ago? This criticism in no way disparages the actions of students across the country protesting gun laws. Ultimately, everyone hopes that the National Student Walkout inspires necessary change. Yet this is simply the latest example of the national double standard placed on the shoulders of black people. Until white people start doing it.